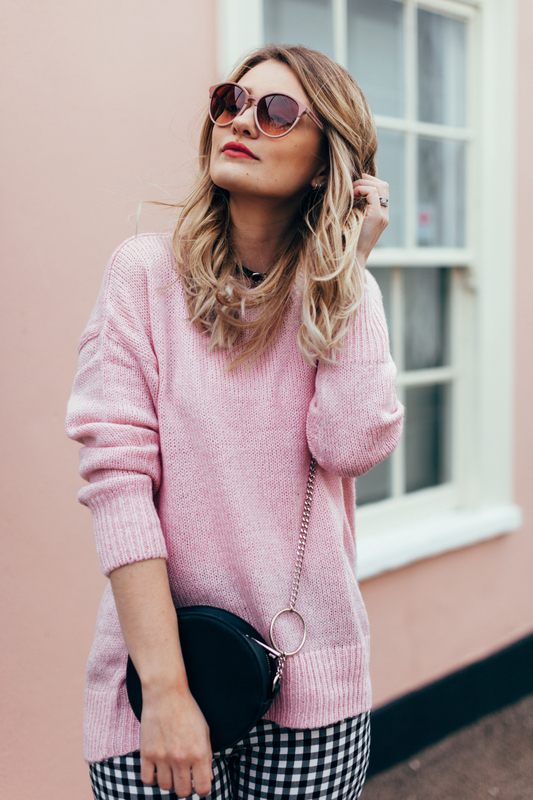 A little pop of pink, a little pop of gingham… I can’t get enough and here’s why! I’ll be the first to admit that I used to hate the term “a pop of…” but recently it’s something I’ve been using much more. Whether it’s just increasing numbers of age I’m not sure, but I have been really loving injecting little pops of patterns into my outfits and it’s the only term that suits it perfectly. On that note, this outfit was all inspired by these gingham trousers. They worked well for me throughout Summer and I felt sad whilst packing them away for the colder months. Then it dawned on me, hey… these could actually look pretty cool with a thick knit and fancy trainers, something I own both of. 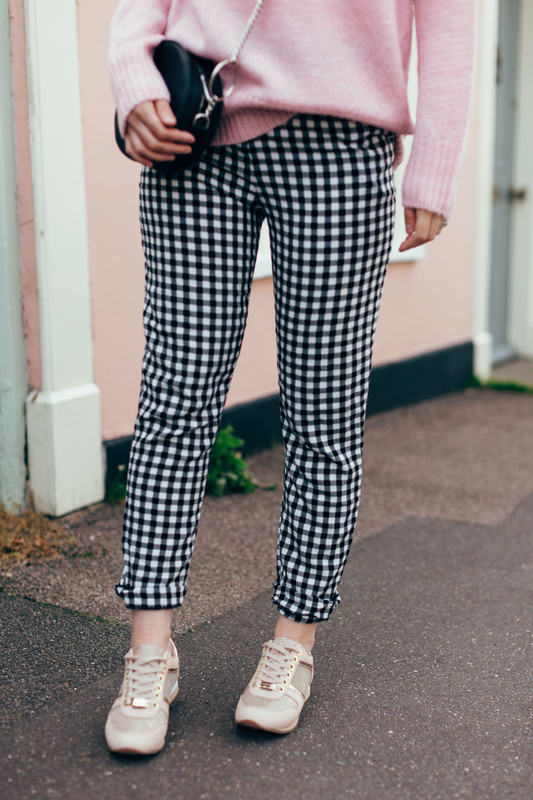 So, here it is… an outfit I saved from the dark depths of the ‘Winter wardrobe’ up in the cobweb ridden loft, proving you can wear your gingham trousers all year through. Previously I stayed well away from the trainers/trouser combo because I thought I was ‘too short’ to pull it off, as sadly I wasn’t been blessed with super model legs. However as I’ve got more body confident and well, honestly? A bit older… you kinda don’t give a you-know-what and start to wear what the hell you want to wear. 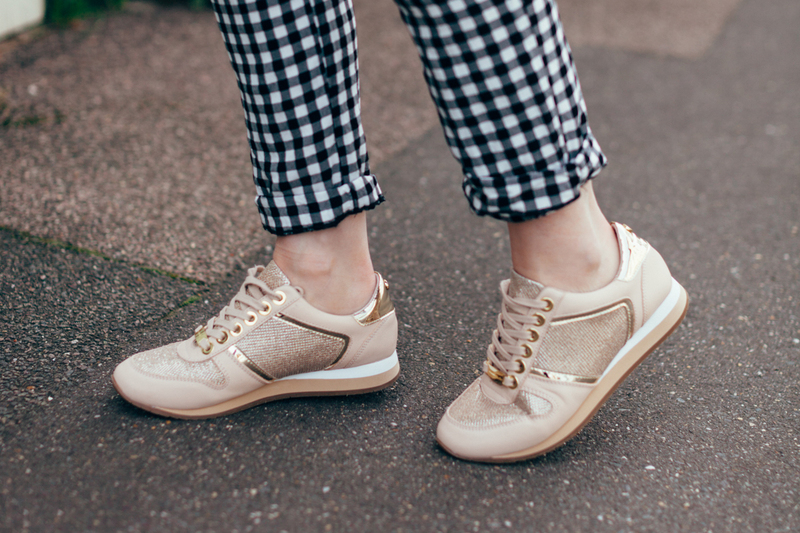 I’m really pleased about this too because trainers/sneakers are now a strong staple in my wardrobe and contrary to my previous beliefs, they don’t shorten your legs half as much as I first thought! These Carvela Kurt Geiger ones are just beautiful too and I get tonnes of compliments on them, infact if I had 4 legs i’d buy another pair.. (age also makes you weird, so it seems…) They might seem a little higher up in the budget rank but actually, when compared to a lot of other well known trainer brands, it’s not by much!